Theories and Healing in Ancient Egypt: Explanatory Models in the Ebers Papyrus? Let op: Deze lezing is in het Engels! Ancient Egyptian medical texts are notoriously difficult to translate. Past editions of these texts viewed their contents from a Western point of view, seeking to identify anatomical, disease, and treatment classifications which are recognizable to a modern audience. 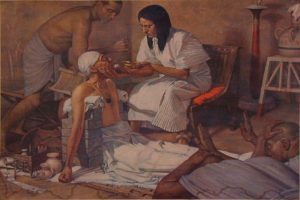 From this, Egyptologists attempted to qualify Egyptian healing techniques and theory as a historical precursor to what is found in Graeco-Roman Medicine (notably Hippocratic and Galenic traditions). Outside of Egyptology, this idea is firmly rejected; one reason being that the Egyptian medical texts are highly esoteric, magical, and ultimately too devoid of reason to have made a significant impact on Classical Philosophy. Both sides of this current debate are problematic; they both analyse the Egyptian papyri from a Western (or Classical) ‘lens’. How do we regain Egyptian notions of human physiology and healthcare from an emic perspective? This talk will outline how the ancient Egyptians perceived the workings of the human body through an examination of the Ebers Papyrus – the largest medical document to have survived from Ancient Egypt (dating to 1550 BCE). Rather than seeking to equate our modern understandings of human anatomy and physiology with those of the ancient Egyptians, the presentation will demonstrate how it is possible to extract ancient perceptions of physiology and disease causation from prescriptions which provide limited information. This paper not only challenges current interpretations of the anatomical focus of remedies, it reconsiders the methods for attempts to historically contextualise the Egyptian healing traditions.